Safety gates, protective covers and machine guards prevent hazards associated with moving parts. However, the correct functioning of a safeguard can only be guaranteed by using the appropriate sensor technology. 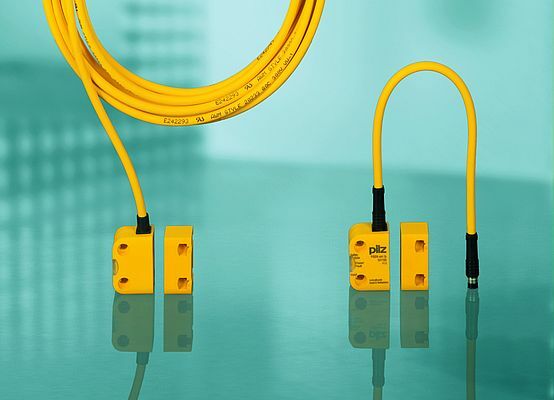 Alex Bryce, Sales Manager at Pilz Automation Technology, considers the sensor systems currently available and the selection criteria that designers should consider. Designers of plant and machinery are normally responsible for implementing the safety-related requirements and for selecting the components used for safe monitoring. However, designers are spoilt for choice, which makes choosing the most appropriate safe sensor or actuator/sensor combination a difficult task. Sensor systems operate using different principles and so it is important that designers fully understand the implications of using each type. The challenge is to try to harmonise productivity with machine safety and user-friendliness. If a safeguard is not user-friendly, there may be a temptation to manipulate a safety guard, putting the machine operator at risk. Designers need to identify potential cases in which safety devices might be manipulated and then to eliminate these at the machine development stage. Certain considerations will help the designer to decide which components should be used for the safe monitoring of movable guards in accordance with EN 60947-5-3. Typical questions that should be asked include: is the cover frequently opened and closed? Does the process need protecting as well as the operator? Are components exposed to high vibration or extreme temperatures, or are they used in potentially explosive areas? For simple safety gate applications where there is no increased risk of manipulation, mechanical safety gate switches are widely used. These are used for simple safety gate monitoring or with a mechanical guard locking device, which uses increased extraction force on the actuator to prevent the gate or cover from being opened unintentionally. Many applications require two mechanical switches to guarantee the required level of safety, which increases engineering costs significantly. Another consideration here is that swarf can quickly be deposited on the sensor, restricting its function. Also, if safety gates drop over the course of time, the lifetime of a mechanical switch is reduced considerably. Mechanical safety bolts are complete solutions comprising a safety switch, handle and bolt. These provide protection where safety gates are difficult to adjust, as well as on safety gates that are frequently opened and closed. A mechanical guide on the actuator ensures that the actuator engages with the safety switch correctly when the safeguard is closed. Mechanical hinge switches provide an elegant solution for rotating or hinged gates and flaps. These provide better protection against manipulation compared to other mechanical solutions because they are concealed within the hinge, which also saves on installation space. Gates, covers and flaps often need to be opened repeatedly for operational or assembly purposes, to enable operators to access or reach into the protected area. Here, the risk of a gate being mechanically misaligned is high. The disadvantage of mechanical guard locking devices is that they only have limited tolerance for misaligned gates. For this reason, non-contact safety switches provide an attractive alternative, particularly if there are high vibrations. These switches have a higher response tolerance, allowing greater flexibility in the way they are attached to the machine. Rugged non-contact switches are also suitable for applications that require protection types higher than IP67. These switches are able to meet safety requirements up to PLe of EN ISO 13849-1, and SIL 3 of EN/IEC 62061, or Category 4 of EN 954-1. When it comes to deciding on the acting principle of the sensor, important distinctions need to be made. Whilst magnetic safety switches provide only limited protection against manipulation due to the technology used, coded safety switches achieve up to 100% protection against manipulation. As a result, magnetic safety switches should be concealed or installed in such a way that they are invisible to operators. If a safety switch cannot be concealed or if 100% protection is required, RFID coded safety switches are ideal. RFID technology enables a clear assignment between sensor and actuator. RFID coded safety switches operate in accordance with the 'key lock principle' whereby only one key - a unique version - fits a lock. Given that the actuator is installed using one-way screws - which can only be loosened via a special tool - a very high level of protection against manipulation is achieved. It is also important to understand that magnetic safety switches have limited suitability if metal swarf is present, which can be attracted to the magnet and deposited on the switch, leading to operational problems or even failures. Although a safety-critical situation cannot arise as a result, plant availability and productivity will suffer. Here, coded switches are ideal, as RFID is unaffected by metal swarf. Various coding types mean that different levels can be achieved in terms of security against manipulation. The greatest protection is provided by systems in which an actuator is uniquely assigned to a switch. Sensors with 'normal' coding are also available if the demands on manipulation protection are less stringent (one lock, many keys). Risks can remain even after a machine has been shut down, due to moving parts. In 'hazardous overrun' cases such as these, the use of a safe guard locking device is mandatory. This means that the gate cannot be re-opened until standstill has been safely detected or a time delay has elapsed. Here, mechanical guard locking devices with spring interlocks are typically used. The spring interlock guarantees that the gate can only be opened when it is safe to do so. 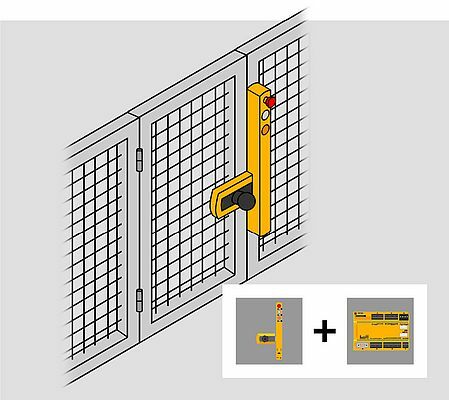 More can be achieved by using integrated safety gate systems that combine safe monitoring, safe guard locking and control elements, including additional functions such as E-STOP and escape release. All components - whether mechanical or electronic - are integrated. Complete systems such as these help to reduce the time and costs associated with project configuration, design, documentation, purchasing and installation. Furthermore, if sensors and evaluation devices are sourced from a single supplier, this means that the interfaces between the various components are already compatible.